Pain generators causing abdominal pain are not always easy to identify and may be located intra-abdominally, in the abdominal wall or in the nearby organs with pain being referred to the abdomen. Abdominal wall pain is frequently unrecognized and leads to a magnitude of investigations, specialist consultations, prolonged suffering, overtreatment, and inefficient utilization of resources. Anterior cutaneous nerve entrapment syndrome (ACNES) is a common cause of abdominal wall pain and involves entrapment of the cutaneous branches of sensory nerves in the lateral aspect of rectus muscle. It was suggested that approximately 2% of patients presenting in the emergency department with acute abdominal pain suffered from ACNES. The diagnosis of ACNES is often challenging as there are no associated specific signs or diagnostic investigations. Awareness about the condition and a high index of suspicion, in those with localized abdominal pain without other clinically significant symptoms, and relief from local anesthetic injection, help in making the diagnosis. We present a case of longstanding abdominal wall pain secondary to ACNES. The condition remained undiagnosed and untreated despite numerous multispecialty consultations, investigations, and surgeries. This case report is aimed at increasing the awareness of abdominal wall pain (specifically ACNES) as a cause of chronic abdominal pain. A 60-year-old female presented with a 9-year history of right lower abdominal pain. She complained of constant burning, squeezing pain in the right periumbilical region of severity 6/10 on the numerical rating scale (NRS). The pain was exacerbated on bending forward and had no relationship to eating or bowel function. She had already obtained opinions from general physician, general surgeon, urologist, and gynecologist. Since the onset of pain numerous investigations including ultrasound, abdominal Xray, and computed tomography scan abdomen were done. These revealed gallstones, renal stones, and uterine fibroids for which she had underwent multiple surgeries including cholecystectomy, appendectomy, laser treatment for renal stones and hysterectomy with bilateral salpingooophorectomy. Unfortunately, these interventions did not change her pain symptoms. The detailed assessment revealed that the onset of pain 9 years back correlated with her puncturing a boil in the lower abdomen with a pin. The area had subsequently developed infection with pus discharge and required two courses of antibiotics. The patient was able to pinpoint the site of maximum tenderness along the lateral border of rectus muscle in the right periumbilical region which coincided with a small well-healed scar from the previously infected boil. On sensory examination, infraumbilical numbness was identified close to the surgical scar from the recent hysterectomy. There were no signs of hyperalgesia or allodynia. Carnett's sign was positive (increased pain on tensing of abdominal muscles while pressing on tender spot). Based on the history and clinical examination, a diagnosis of ACNES was suspected, and ultrasound-guided anterior cutaneous nerve (ACN) block was planned. After taking written, informed consent, the injection was performed on the same day as an outpatient procedure. A high-frequency (10–15 MHz) linear ultrasound probe was placed along the transverse plane to identify the anterior abdominal wall layers including the subcutaneous layer, rectus muscle with linea alba (medially), linea semilunaris (laterally), and the peritoneum. Focused scanning of the tender area along the lateral border of rectus was performed to identify the hyperechoic ACN and the adjoining blood vessels close to the posterior border of rectus. Using an in-plane, lateral to medial approach, an insulated 22-gauge, 50 mm nerve block needle (Stimuplex A, B. Braun) was guided through the rectus muscle to close proximity of the ACN. A volume of 2 ml of 1% lidocaine with 20 mg methylprednisolone was injected, and the spread of medications was visualized along the posterior border of rectus muscle. Complete resolution of abdominal pain, i.e., 0/10 on NRS, immediately after the injection confirmed the diagnosis of ACNES. Postprocedure, she was prescribed tablet Pregabalin 75 mg twice daily. At 4 weeks' postprocedure, her pain was satisfactorily controlled with pain scores of 2–3/10 on NRS. She was advised to continue with pregabalin at the current dose. A follow-up appointment at 12 weeks' postprocedure was arranged which she did not attend and was lost to follow-up. Chronic abdominal pain is commonly attributed to intra-abdominal causes with abdominal wall being overlooked as a potential source of pain. 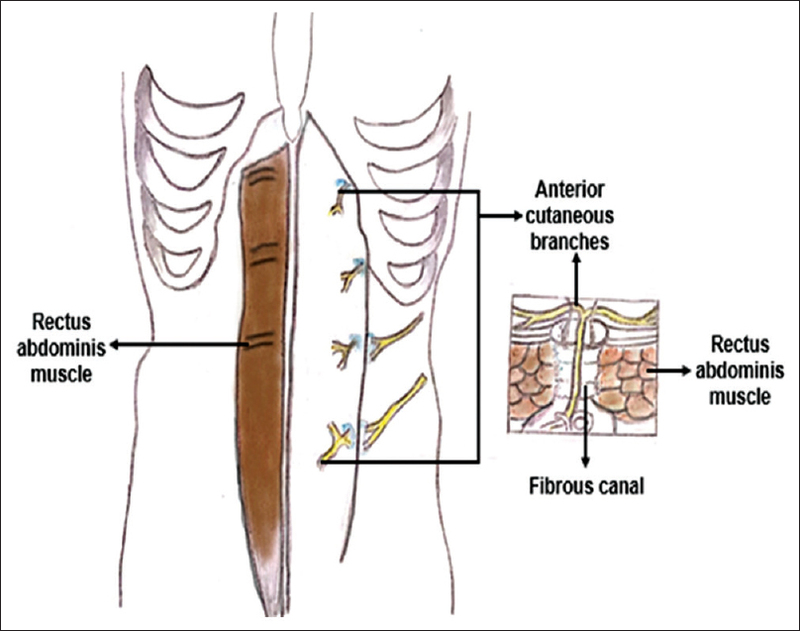 In 2%–3% of patients with chronic abdominal pain, the pain arises from the abdominal wall. In patients with previously diagnosed chronic abdominal pain who have no demonstrable pathological abnormality, this likelihood can rise as high as 30%. Hall and Lee suggested that about 15% of persistent chronic nonspecific abdominal pain can originate from the abdominal wall. ACNES was first described by Applegate in 1972 and a Dutch study has estimated the prevalence of ACNES in general population as 1 per 1800 persons. Abdominal wall receives innervation from lower intercostal nerves (T7–T12). These travel in close relation to the ribs and then further distally between abdominal muscle layers to reach the rectus muscle. Close to the lateral border of rectus muscle, they change direction making an acute turn, traversing through neurovascular channels in the muscle to reach the anterior surface and terminate by supplying the skin [Figure 1]. ACNES involves entrapment of these nerves as they traverse through the rectus muscle. The muscle contraction at this location may cause additional nerve compression and therefore mechanical or ischemic irritation, which results in severe pain.,, These nerves are more prone to entrapment at locations where they cross from one fascial plane to another. Other factors which may contribute to entrapment include scarring from local trauma or previous surgery and increased intra-abdominal pressure. 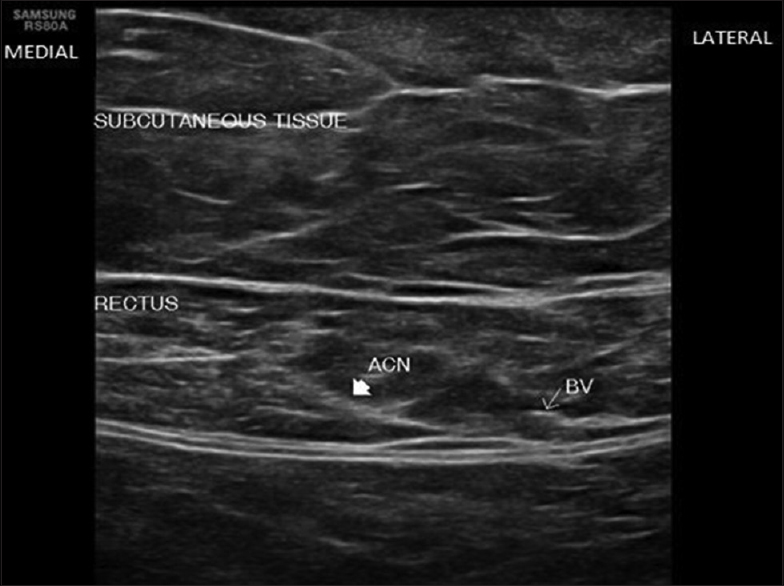 ACNs can be identified using ultrasound. They appear as hyperechoic oblique lines traversing through the substance of rectus muscle [Figure 2]. As these nerves are small, investigations such as CT and magnetic resonance imaging may fail to pick up the pathology. ACNES presents as localized unilateral abdominal pain and patients can usually pinpoint tender spots along the lateral border of rectus muscle. The pain may be provoked by posture change or tensing of rectus muscle and is generally independent of food intake, bowel habits. Carnett's sign is a helpful diagnostic sign, especially when incorporated with other findings. This test involves localizing the tender spot along the rectus and pressure is applied on the tender spot while the patient tenses the rectus muscle as by lifting the head. Tensing of rectus increases the entrapment of ACNs thereby increasing the pain in ACNES, whereas pain may reduce or remain unchanged if originating from visceral sources. According to Kanakarajan et al., ultrasound-guided injections of local anesthetic or a combination of local anesthetics and steroid are used to confirm the diagnosis and provide pain relief. Ultrasound guidance can help to identify local pathology (such as fibrosis and rectus defects) and improve the accuracy, safety of injections. Boelens et al. published a large database of patients with ACNES who were diagnostically confirmed with injection. In their study, one-thirds of the patients who received injection therapy got permanent pain relief., In the study conducted by Koop et al. combined local anesthetic and steroid injections into the painful area relieved pain for 4 weeks in 95% of patients. Long-term pain relief ensued after a single lidocaine injection in 20%–30% of patients, after repeated injections in 40%–50%, and after combined lidocaine and steroid injections in up to 80%. The main treatment regimen for ACNES remains ultrasound guided injections with local anesthetics and corticosteroids. If a series of injections are unsuccessful in providing adequate long term relief then other treatment options reported in literature include chemical neurolysis, surgery (neurectomy or nerve decompression), and botulinum toxin injections. Weum and de Weerd reported the use of ultrasound-guided injection of botulinum toxin at the site of maximal tenderness in 15 patients with ACNES. Patient education is an important component of treatment, and an explanation of the diagnosis brings lasting reassurance. The authors have observed ACNES after surgeries such as cesarean section, open/laparoscopic abdominal surgery, donor liver transplant, and hernia repair. On numerous occasions, they have successfully identified and managed ACNES, with the help of one to two ultrasound-guided injections. To conclude, chronic abdominal pain can be a diagnostic challenge. Low awareness about ACNES and lack of specific diagnostic tests, investigations contribute to the missed diagnosis leading to prolonged suffering and wasted resources. Increasing awareness can help in early diagnosis and effective management of ACNES. A comprehensive evaluation can help in early recognition and management, especially when dealing with localized persisting abdominal pain without an attributable cause. We would like to thank Dr. Rishabh Aggarwal (Secondary DNB Resident Radiodiagnosis), for processing of ultrasound image [Figure 2]. van Assen T, Brouns JA, Scheltinga MR, Roumen RM. Incidence of abdominal pain due to the anterior cutaneous nerve entrapment syndrome in an emergency department. Scand J Trauma Resusc Emerg Med 2015;23:19. Koop H, Koprdova S, Schürmann C. Chronic abdominal wall pain. Dtsch Arztebl Int 2016;113:51-7. Hall PN, Lee AP. Rectus nerve entrapment causing abdominal pain. Br J Surg 1988;75:917. Applegate WV. Abdominal cutaneous nerve entrapment syndrome. Surgery 1972;71:118-24. Applegate WV. Abdominal cutaneous nerve entrapment syndrome (ACNES): A commonly overlooked cause of abdominal pain. Perm J 2002;6:20-7. Srinivasan R, Greenbaum DS. Chronic abdominal wall pain: A frequently overlooked problem. Practical approach to diagnosis and management. Am J Gastroenterol 2002;97:824-30. Kanakarajan S, High K, Nagaraja R. Chronic abdominal wall pain and ultrasound-guided abdominal cutaneous nerve infiltration: A case series. Pain Med 2011;12:382-6. Boelens OB, Scheltinga MR, Houterman S, Roumen RM. Randomized clinical trial of trigger point infiltration with lidocaine to diagnose anterior cutaneous nerve entrapment syndrome. Br J Surg 2013;100:217-21. Boelens OB, Scheltinga MR, Houterman S, Roumen RM. Management of anterior cutaneous nerve entrapment syndrome in a cohort of 139 patients. Ann Surg 2011;254:1054-8. Weum S, de Weerd L. Perforator-guided drug injection in the treatment of abdominal wall pain. Pain Med 2016;17:1229-32.